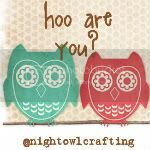 I missed last week’s Hoo Are You… it’s was a crazy week. Unpacking, sick baby, piles of laundry, gearing up for Christmas in my Etsy shop. And trying to get things in order to deliver gifts on our next trip. I have to have Christmas done for 2/3 of my list in the next two weeks. Like I said, cRaZy! So, anyway, here are this week’s questions. Uhm, dropping things and “making it work”. I so often don’t think things all the way through. And it gets me in trouble… And I’m clumsy… not a great combination! 2. Name two things you consider yourself to be very bad at. 3. Do you believe everything happens for a reason? 4. What is something you have eaten lately that you shouldn’t have? hahaha… that half a pan of mint chocolate chip brownies…. 5. Do you think the time should change or leave it alone? Leave it alone. It messes my little boy all up!